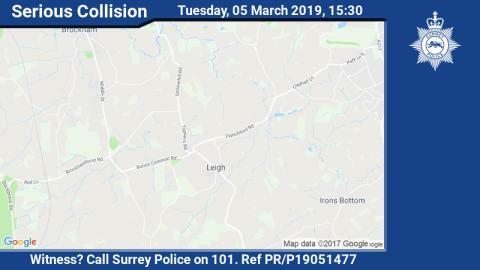 We are appealing for the public’s help to understand what happened to a cyclist who was involved in an incident in Reigate earlier today (5 March). We were called to Flanchford Road, Leigh at approximately 3.30pm following reports that a cyclist had been involved in an incident and suffered serious injuries. Officers are carrying out enquiries to establish the circumstances that led to the man receiving serious injuries. The man is described as white, in his 60s, he was cycling on a yellow Cobra racing bike. Sergeant Kellie Harris, of the Roads Policing Unit said: “We are keen to establish the circumstances that led to the man receiving serious injuries. He has been taken to St George’s Hospital by air ambulance, and his next of kin has been informed.